Printing & Copying Services, U.Va. UVA Printing & Copying Services is here to help you maximize the exposure of your message. Print holds its own in the world of multi-channel communication. UVAPrint offers digital and conventional full-color printing as well as a diverse fleet of office printing and copying equipment for lease. With full design, mail, and wideformat capabilities we are your best choice for low-price, top-quality printing. We offer friendly customer service, quick turnaround, and free delivery. And we can assist you with the new University branding requirements. We even offer custom embroidery for personal apparel or promotional items! Contact Josef Beery at 924-7186 or jb6y@virginia.edu for help with your project. The Virginia Humanities public program known as the Center for the Book recently hosted their first visiting artist to Charlottesville. Amos Paul Kennedy, Jr was invited through the new Frank Riccio visiting artist endowment to come share his work with the Charlottesville community. Kennedy, an internationally known printer (he dislikes being referred to as an "artist"), had recently been featured in an inaugural show at the new Institute for Contemporary Arts in Richmond. His infectious good humor and irrepressible social commentary make Kennedy an effective builder of community, especially in those places suffering the wounds of racial conflict. Kennedy spent several weeks in Charlottesville this March working with hundreds of school children and community members. Their efforts resulted in the creation of over 10,000 posters written, designed, printed, and displayed by the participants. Exhibits of these printed posters have been made throughout public venues at the University and the community (you may still see them on display at the Jefferson Madison Regional Libraries, the UVA Art Department, the Jefferson School African American Heritage Center, and UVA Special Collections, as well as at a number of local businesses). The book arts program of the Center for the Book acted as a host for Kennedy. 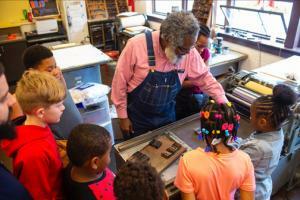 This program got its start over two decades ago when equipment from the University Printing Office was transferred to the Virginia Humanities for community use. A Vandercook proof press and dozens of cases of metal and wood type became the nucleus of a workshop and classroom program which is now a dynamic center for activities of artists and other community members. WHO KNEW what life this obsolete printing equipment still had to offer!